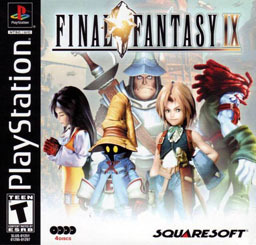 \'Final Fantasy IX\' tells the story of Zidane, the member of a team of theater actors who also happen to be a gang of thieves, and Garnet, the princess of Alexandria. Zidane and his friends first plan to kidnap Garnet from her mother\'s palace. But shortly after the kidnapping, they realize the queen of Alexandria is up to something evil. You can cast spells, summon up monsters (and gods), drink beer and the like, but this is true with most RPG\'s. Zidane, is a bit of a pervert in the beginning, but not much is ever made of it. In a certain part of the world, people can be found praying to a sandstorm. Eiko and Garnet pray to their ancestors, something I found a bit disturbing. A group of people talk of going down \'The Path of Souls\' when you die, and other such nonsense. In an important plot point, Cid talks of his wife leaving him after he had an affair. At one point, everyone in your party, except Zidane, passes out. And after they wake up, one of the members accuses Zidane of erm?\'touching\' Garnet. In a strange sequence, Zidane and Vivi urinate on the side of Eiko\'s house. We don\'t see anything, but it is an embarrassing scene. Zidane is a thief, but the enemy you steal from is going to die anyway, so does it really matter? There is mild innuendo, but nothing horrible. There are some mild references to demons, like a piece of armor called \'Demon Mail\' You can battle an optional boss called \'Hades\', but now I\'m being nitpicky. There is swearing, about PG-13 level, nothing horrible, but not so good for the kids.